The Haas Lifestyle Collection has two main styles of paint. To browse each of them, click on the links below. Classic paint colors consist of our most popular paint colors. These colors are time proven to be popular over the entire life of the kitchen, not ones to fall out of favor when styles shift (remember Harvest Gold?). Glazes, highlights and distressed features are available on Classic painted products to provide a truly distinctive look. Color Choice paints are for the really adventurous. Just about any color you can think of is available to make your kitchen, vanity, or whatever you desire into a truly personalized product. For additional variety, a wide choice of accents is also available for Color Choice finishes. Glazes and Highlights allow you to add a touch of personalization to painted products by softening the sometimes overwhelming single-color dominance that can be associated with some paint schemes. These colored features are applied only to the hang-up areas of doors and drawer fronts so it does not affect the overall color of the painted product. Accent colors are available on any paint color. Distressed Features include the sanding off some painted areas on doors and drawer fronts to expose the raw wood underneath. This raw wood is then treated with a light colored stain to lessen the sharp white appearance of the wood. Once clear varnish is applied to the product, the exposed wood areas contrast to the clean painted surface provides a nice, warm look alternative to today’s more polished, sterile painted finishes. 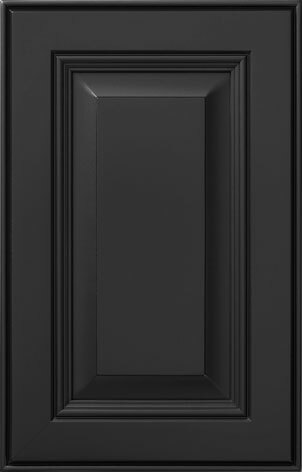 Painted finishes are available on all cherry, hickory, maple and oak door styles. 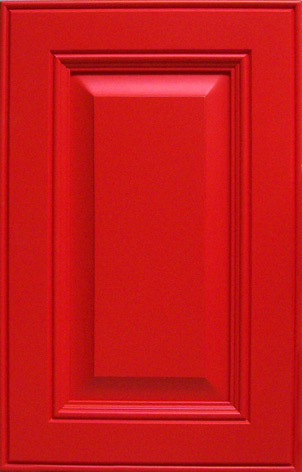 We are showcasing maple painted doors only on this web site.